A lady who wants to impress a potential husband will make for him the most basic of home-style Japanese cooking - Nikujaga. If she gets the perfect balance of flavours to suit his taste, then it's a match and he'll fall in love. 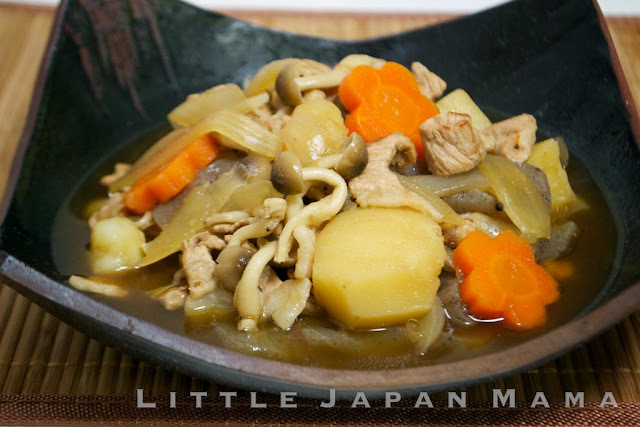 In spite of its legendary powers, nikujaga (meaning meat-potato) is the simplest meal to make. Meat, potatoes, onions and some carrots. Some people use beef, some use pork. I generally use beef, however this time I tried pork. Ito-konnyaku is also often included, but this time I used a block of konnyaku. I love Shimeji Mushrooms so I threw some in. Heat a little oil in a saucepan or wok. 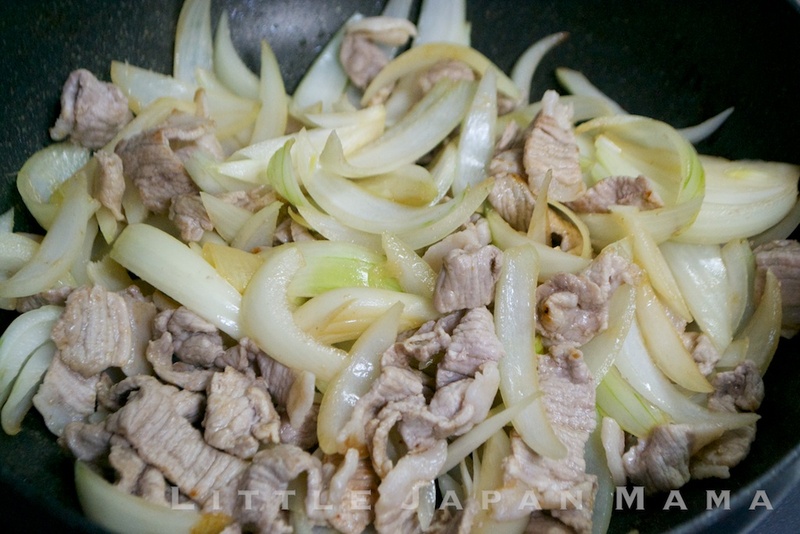 Stir-fry the meat and onions for a couple of minutes. Add potatoes and stir-fry a little. Add all the other ingredients except carrots. Add carrots 5 min later. Simmer for a further 20 min. Test to see if it's done by poking a potato with a chopstick. The chopstick should easily poke through the potato. Serve in individual bowls with a bowl of rice on the side and, if you like, miso soup and a leafy salad. 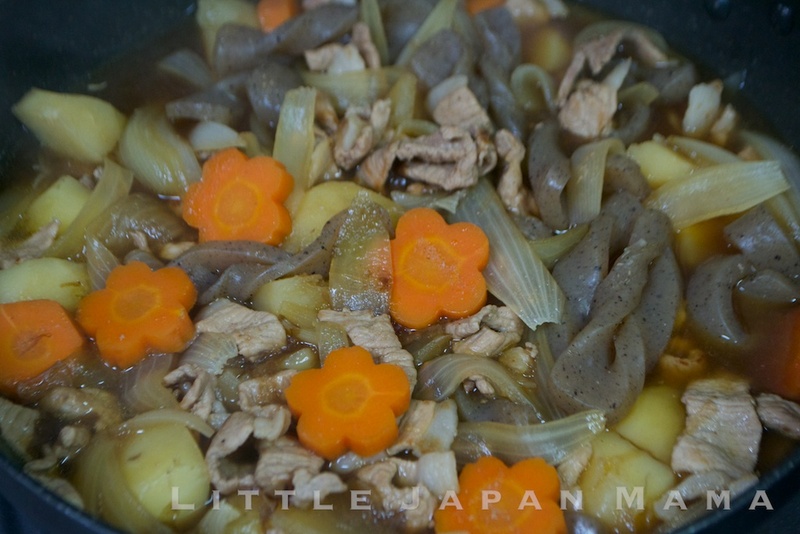 Actually the real reason I made nikujaga tonight was that my little boy wanted to cut carrot flowers, and kept pulling the carrots out of the fridge. I gave in, and as you can see, we had carrot flowers. The pork I used this time was not ideal actually. Should have used the paper-thin stuff, or used beef like I usually do and stewed it longer. This is on my menu for the week too! :)yours looks delish! ^_^ YAY we're all having Nikujaga! It's one of the essentials of Japanese home cooking, isn't it! I'd miss the texture of konnyaku if I used this recipe. 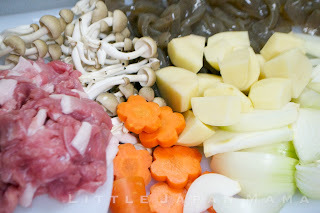 Love your blog, made your beef bowls tonight. We lived in Yokosuka for three years and I miss it so much. I have a question, how do you make the carrot flowers? I'm in culinary school right now and the carrots look like they'd make a nice garnish. I've made this dish before following your recipe to a T! It came out great when I first had it, literally warms my soul. I can see how this dish is a way to a man's heart, it sure is to mine!